A collection of all 30 Ash vs. Evil Dead episodes. 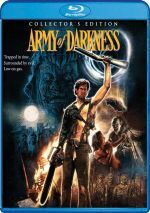 Back in 1992, Army of Darkness represented the third – and final – of the Evil Dead movies. The franchise got a 2013 reboot but it looked like the original cast would never revisit the characters. In 2015, the series came back to life via the Starz Channel’s Ash vs. 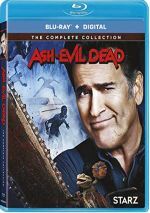 Evil Dead, a show that brought back Bruce Campbell as lead monster-fighter Ash Williams. Though fans loved it, I guess it didn’t get great ratings, as it only lasted three seasons. Oh well – at least it died young and left an attractive corpse. Inevitably the shows came with some ups and downs, but Ash usually brought us a fun, crazy mix of comedy and gory action. This “Complete Collection” packages all 30 of Ash vs. Evil Dead’s episodes. It literally replicates the previously-released Blu-rays, so nothing new appears, but it becomes an efficient way to own the whole series in one fell swoop.